The photo is of some Heroscape dice repurposed into Blood Bowl style dice to use in a new combat resolution system. Exciting huh? Well, it is to me at least. Inspired by Chris K of the Basement Gaming Bunker's recent rediscovery of my Gut Check! rules, I have been thinking about how to progress them to V2.0 and also re-ignite my interest. I think they were a fun set, but required a lot of additional work on my part and I ran out of steam. I'd like to take some of the ideas that worked well (the titular Gut check, a 1d6 system originally similar to THW rules, and the action choices) but replacing all the clunky bits... Especially the hexes, which put a lot of people off I imagine. I am tentatively naming this new version "Throwdown" to keep me focussed on the new objective... That being you should be able to grab a bunch of minis you already have and throw them down on the board with as little prep as possible. I want to have enough gambling and tactical decisions to be fun, but an absolute minimum of bookkeeping, chart lookups and needless complexity. The game is more solo centric, based on the player taking a 5 man team. It is no longer a game trying to cover platoon sized actions. I made a harsh review of any rule that seemed "clever" but had limited real-world effect on the battle. Models that fail activation go on guard.. A feature inspired by later editions of FUBAR. New combat mechanic. Total up factors like shock counters, range, target speed, cover etc, then resolve an exchange of fire with a single Blood-bowl like roll. This models both parties firing at each other and the final result, rather than individual shots. It's a partial replacement for a more detailed reaction system. A streamlined reaction system. Only models with "guard" actions get to react by passing a gut check. Replaced hex movement and weapon ranges with SOBH styled " Short Medium and Long" distance measuring. Removed the "Choked" condition. Shock markers model suppression as much as I want to without an extra condition that needed a counter on the table. Stopped all figures reacting all the time. Too much headache, too much dice rolling. Removed my (brilliant!) chit activation system. The concept was good, but there are much less complex ways to govern enemy actions. Having proper scenario goals for the AI makes a big difference here. I have the new combat rules done in a bare-bones form, and team construction rules mostly done ( I will need help to fine tune here, I'm not great at math.) so apart from some playtesting, I have to get some scenarios done... Straight out "kill each other" battles have a tough time holding my interest these days. PS- Special thanks to all the folks who wrote in with playtest observations, your notes really helped shape the newer version. 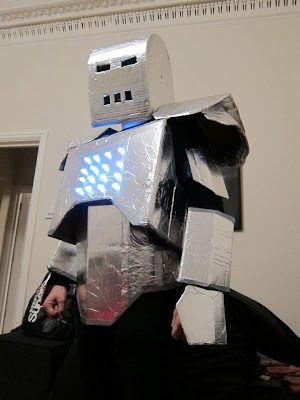 I'm not sure how big I am in 15mm scale, but here's the costume I wore into town last night to a gig and then drinks.. The lighting is a cheap set of Christmas lights that are LEDS with a 2xAA power supply. With the helmet off, the chin lighting made me look like a bearded Chuck DeNomolos. I'm especially proud of the 2-part torso design that allowed comfortable freedom of movement and a telescoping action that allowed me to sit down without the thing smacking me in the chin. I decided against legs , settling for silver glitter converse all-stars and black jeans. In retrospect I wish I'd gone with an Iron Giant design with articulated jaw for drinking.. Oh well, next year. Happy Halloween from Tiny Solitary Soldiers! 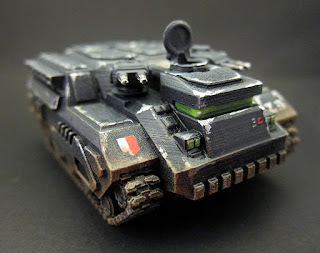 Jon at Khurasan recently sent me this Cane Toad APC. 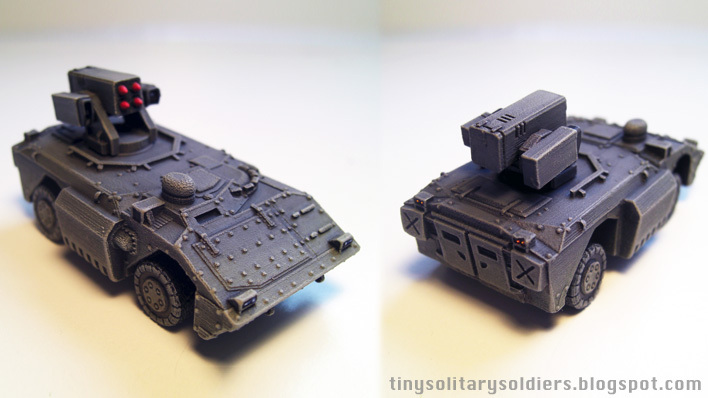 I was going to paint it up for my Star Army forces, but the first two attempts at undercoating it failed due to me not cleaning it enough and release agent messing things up. 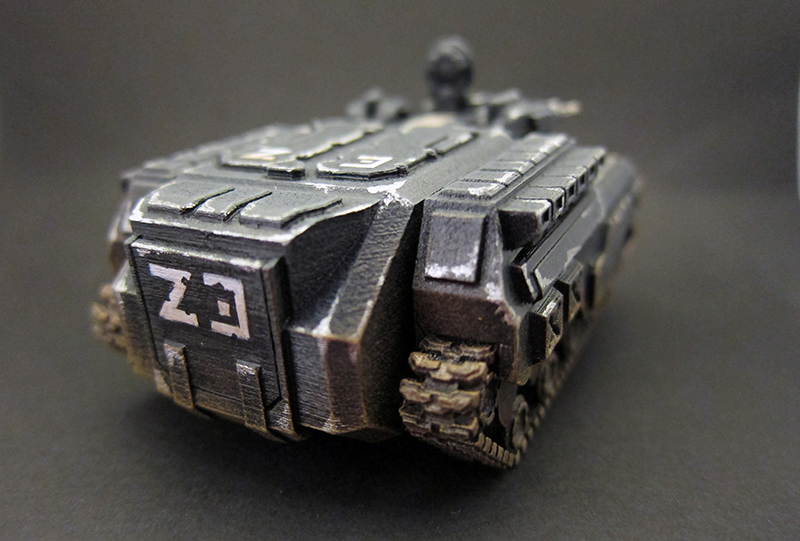 So a heavy black spray undercoat was called for and the vehicle switched sides to Zeig. Once I got going, a pretty easy paint job. Freehanding all the markings was the hardest bit, but I don't have any decals and a black tank looks pretty bland without some detail like this. Apart from that it is 100% drybrushing grey over the black basecoat, then painting on the metal chips with plain old GW Mithril silver. A quick dirty wash to unify it, then the same colors I use on my bases drybrushed up in stages for the dirt. The window slit os green to match my Zeig eyepieces. Exo armor, REP 5, Assault rifles. Here's my initial squad of Khurasan Riflethings. I did these alongside a Cane Toad APC, which I have just photographed and sent off to Jon, so it will be up on the blog soon I hope. Intentionally simple colors for fast painting and maximum menace. After a black undercoat there wasn't much at all to these guys, I did them in one go. They represent elite or heavy troopers for my old Zeig forces. I have added some detail to these to bring them into line. Hardsuit armor, REP 4, Assault rifles. I repainted their fatigues Russian green and the officer's red. I know it's unrealistic but it's for the benefit of my eyes during a game! 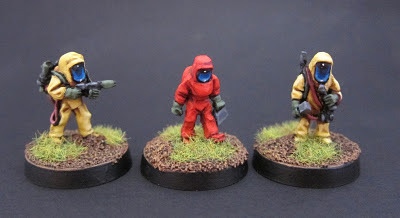 I'm also doing some Jersey Devils for Khurasan (3 out of 4 painted) and other surprises that have reduced my blog output somewhat due to secrecy.. But it's a small price to pay for the excitement of getting unreleased figures to paint. 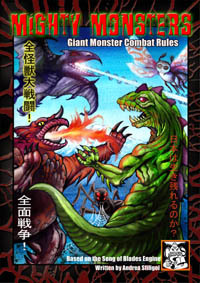 Ganesha Games has released the PDF rules for Mighty Monsters, a Kaiju (Godzilla movie) minis rule set. There is one problem.. They are not yet available in English. Gah! However they are set for English Release on November 10th, so I'm pretty excited. A pile of Crom counters all sculpted and made by me. I have Litko tokens, I have the ability to make card printed counters... But there's nothing quite like a proper 3d item to use as a counter.. And nothing beats 100% custom now does it? I sculpted the master onto a UK penny. It was harder than I thought it might be so I went for a very beat-up looking coin. The next stage was making a few press-molds out of Oyumaru. This is what "Instant mold" really is at a significant markup. I got mine on Amazon for cheap. It's good stuff. After that it was just a matter of filling up the molds with ProCreate and waiting until they were cured enough to pop out and do another set of 3. It took all day to make 12, but not bad considering. Painting was a snap. Black undercoat, metallic drybrush, wash of my deep brown Kleer/ink mix. Done. Hopefully the Kleer (Future Wax) will make a good solid coating so they don't get too chipped when mixed up in a bag. What am I using them for? Initiative counters. Making my Initiative card deck kinda redundant. Glad I didn't make them too colorful. I've been quiet about these until today, but I just saw them up on the Khurasan store after reading about them on daddyslittlemen.blogspot.com. These are fantastic figures! I hate to say it but I think they are actually cute. Especially the female scientist (in red) who is walking in what looks like a fairly cumbersome way. Not much to the painting. Jon asked for yellow suits in the classic Hazmat style. I did the gloves in a military/surgical green instead of black, because I didn't want the hands to vanish into the guns, which are also black/grey. 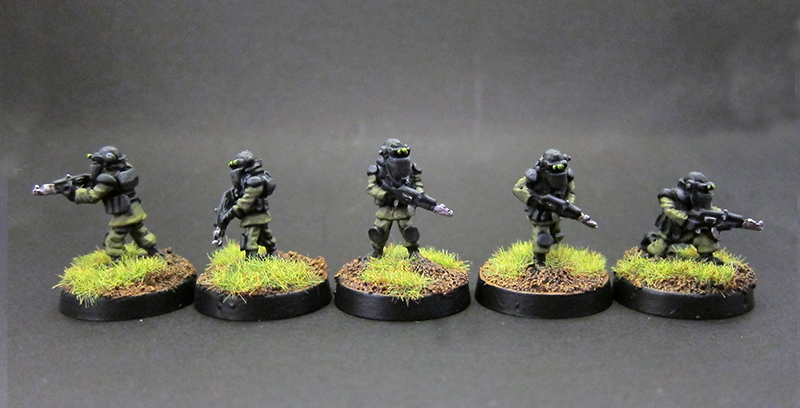 I did the faceplates in the gem style I did my UNSC troops that has proved so popular. It worked pretty well. I have to say again that 15mm scale figures really rely heavily on contrast and exaggerated details. 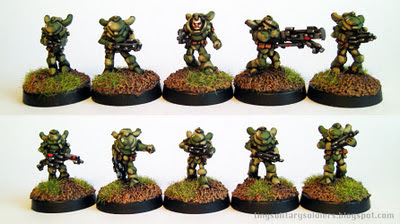 While I was painting these, I got excited and ordered the exterminator squad, the riflethings and the navy seals.. I know, I don't need them but I've been trying to resist them for so long I broke down. Jon slipped some very interesting extras in with my order which are unreleased and secret again, but I think regular readers will think they are pretty cool when they come out. "...there wasn't much to set one apart from the other. All 12 Dice characters would essentially be the same figure. To combat this we started looking into alternatives." This is exactly what I was trying to address with my weapon and armor stats and musings on skill cards. After another think, a good solution that's streamlined (my favorite type of solution) is to combine all these ideas into one mechanic. For me the best thing about Crom for a solo player is the suspense. You don't know exactly how an action will play out before you roll the dice. Therefore persistent skills are less interesting (to me). Today's idea is that rather than skills, player characters are capable of Stunts. These are one off cool moves that you would see in a movie as a high point of a battle. Example: Legolas in the LOTR movie skates down some stairs on a shield and shoots a goblin. This is a stunt. If Legolas always skated around on a shield it would be a persistant ability. It doesn't have to make a lot of sense, it's about a cool moment that demonstrates something about the character. In this vein, I'm working on a set of Stunts that are either a cool maneuver or require specific equipment, but are still only one-shot abilities. This way, the cards can be used in a tight spot, or to change the odds rather than simply making the character better all the time. Play after combat dice are rolled, either in attack or defence. Discard one enemy die of your choice. That's all for now.. But I like where this is heading. They are black and white and sparse to try to save on printer ink. I still might make counters and write the same names on them somehow, as counters or poker chips in a bag are actually quicker to "shuffle" than cards, but I thought of this just now. I like the terms at least. Okay, so I just played a 1.5 games of Crom Solo. Here's a quick report. 1. Played the original Conan Movie soundtrack. It was ace. 2. Set up a small board using Heroscape terrain. 3. Used the stats on the main Crom page for 3 cultist Minions (KM Octo cultists with tridents), a wizard priest (KM Octo high priest) and a shaggy beast (Blue moon Twanax) pitted against 3 heroes. 4. no scenario. Used full rules plus my add-ons. Didn't bother with summoning, just let the priest use his magic dice to throw ranged attacks. Used colored chits drawn from a bag to determine initiative. Results: Gave up halfway cause I lost track of what I was doing. The measuring was quite annoying, but the ranged combat (which requires it) was cool. On activation, an enemy model rolled a d6 to determine it's target. 1-3 the objective, 4-6 kill nearest Player figure. Despite my last post on the matter, I quickly re-adopted my hex movement rules. They worked absolutely fine and I definitely prefer them now. Who'da thunk it. Movement: declare your target hex. Roll your move dice. 3+ is required to enter an empty hex, 4+ is required to enter a rough terrain hex or climb up a ledge hex. Dice that do not meet the required target for the hex are used up. In practice I found that the movement was still uncertain (and therefore suspenseful) but much easier and faster than measuring. The weapon ranges were no problem either. Long reach weapons can attack an adjacent hex, short reach weapons can attack a figure in the same hex as the attacker. I counted the tridents and Krugg's 2h sword as long reach weapons. Player figures: May convert as many hits as they like into push back results. A Push back is one hex, directly away from the hex-side that the attacker entered through (effectively away from the attacker) the attacker follows up. Enemy figures: Will convert the first hit into a push back if possible, but must take the rest as hits. Monsters are never pushed back. Solid scenery or sheer drops may not be pushed back into, take a hit instead. Difficult terrain or ledges can be pushed back into, but the defender will fall if the attacker rolled any 6's in their attack. Fallen figures lose all their remaining dice for the turn, but hop up at the start of their next turn. It worked out really well! I definitely need to make a deck of cards or chits for initiative purposes, but that won't be hard. Scenarios are going to be key here. I think the next step is to write a couple of simple scenarios. And maybe some more interesting magic spells. More of these amazing figures painted. The secret really is doing one at a time. The blonde guy got some gray pants to try to stop all these figures looking like Conan in different poses. This pack could easily be used for one barbarian with different equipment and at different levels in an RPG game. It's notta tureen, it's a halmat! Guarrrrrr! 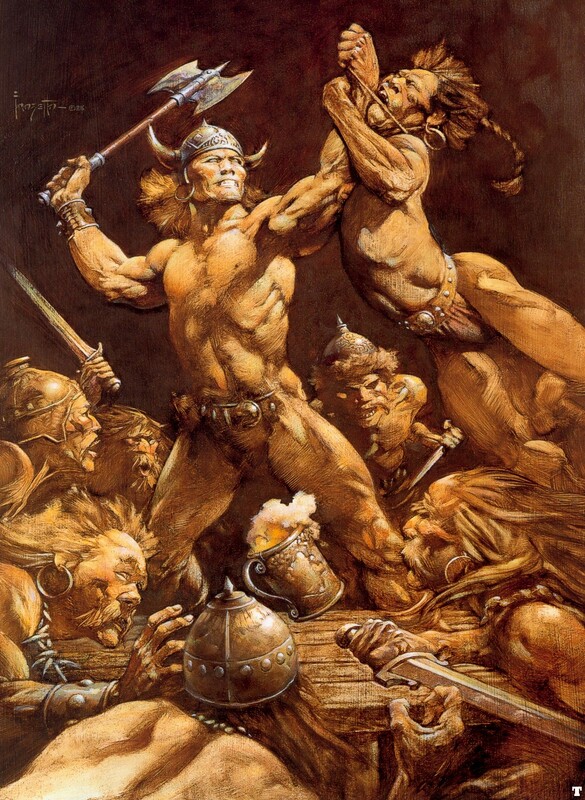 I mentioned in my last post that I had come up with some major modifications to the very clever Crom rules. The biggest part of these were the use of hexes instead of measuring. Largely because I've got some and I hate measuring. However the more I tested it, the less flexible it became. In a 1 on 1 fight they were great, but once I introduced more figures and special rules, they kind of broke down. here is what I was left with, admittedly not much, but I think this adds a little more barbarian fun without significantly changing the great system already written. 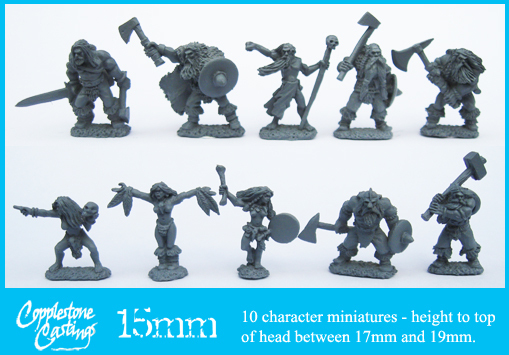 These are just small bonuses to your dice totals to add a bit of flavor to differently armed models. Each additional attacker +1d6 to total. To add a more swashbuckling element to the swordplay, I devised this rule. It favours a terrain setup with a lot of perilous features like ledges, lava pits, rope bridges etc. When a figure takes a hit, it may elect to instead be Pushed back. First, the defender decides how many hits it will convert into push-backs. The attacker then chooses a direction (must be in the attacker's front 180' arc) and rolls a number of D6 equal to the number of push-backs and adds them together into a total. The defender is pushed back this distance. The attacker may choose to follow up and remain in contact, or remain where they are. If the attacker rolls any 6's when making the push-back roll, he may instead of pushing the defender back, elect to switch places with the defender! Handy if the attacker has his back to a cliff. If the pushed-back figure contacts a terrain feature (fallen log, large rock, tavern bar, etc.) It will take 1 hit. If the pushed-back figure enters difficult terrain, it may fall. If the attacker rolled any 6's in the push-back roll, the defender is knocked over and suffers a -1d6 penalty to any attack or defence rolls until it gets up, a difficulty 4 special action (not sure about what number to set for this actually). Otherwise be pushed back through the difficult ground normally. (Taking a leaf out of the SOBH book) If a figure loses all it's dice as the result of a a single attack roll, it is decapitated, burst or otherwise horribly killed in a manner that terrifies it's allies. When this occurs, all allied models with LOS to the death lose a dice from their pool for the rest of the turn. The dice are replenished at the start of their next activation. Make a deck of stunt-like special attacks. Before the battle, randomly draw one per hero. may be played and then discarded at any time during a figure's activation. Noggin knocker: If you have 2 enemies in base contact, you clonk their heads together. Each one takes a hit. Mighty blow: You strike a mighty blow. Use when an attack has been successful. Armor is ignored, and push backs are not allowed against any hits caused by the attack. Right in the nuggets: You kick your opponent in a sensitive area. It immediately loses all it's dice until it's next activation. Oath of fury: Veins standing out, you bellow a blood curdling speech, shrugging off your injuries and hurling yourself back into the fray! Regain d6 lost dice. With all of this stuff, the battles will hopefully take on more of a crazy cinematic brawl. Special thanks to Matakishi for writing the Crom rules and making them available on his site. I went with a lighter skin tone this time as I'd like to see some variety in the warband. I almost did her hair red, but I'm going to save that for the one with the chain-mail bikini. I'm developing a barbarian addiction. Last night I basically re-wrote the Crom rules to suit me better (more combat options, different dice pool, uses hexes.. Not really the same game anymore) after painting this little beauty. I really want to have a go! Here's the catch: You can't get this pack in Europe. In fact the only place you can get it is at Boscov's in the USA. They have an online store but do not ship overseas. So frustrating! This is where you come in. Do you like the looks of the Orion Heavy Infantry (power armor) that Blue Moon Manufacturing sells? Do you like the paint job that you can see on the website? I hope so, because I did it... Do you see where this is going? I'm looking for a swap here, US citizens. 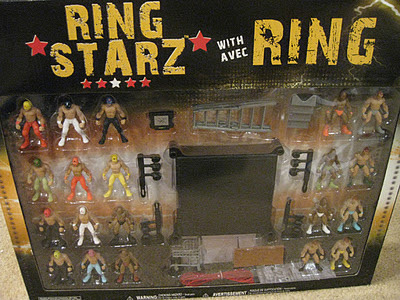 If some kind American reader lives near a Boscov's or can order online from this link , then I will trade you my painted Orion heavy infantry pack (all 10 figs) and a Khurasan Gun carrier in exchange for 2 of the pictured 20-pack of toy wrestlers. I will also pay for the shipping from your place to mine! So that's the deal.. Grab 2 packs of toy wrestlers (currently for a total of $30 USD) and I will paypal you the shipping to the UK and you get some badass 15mm goodness. 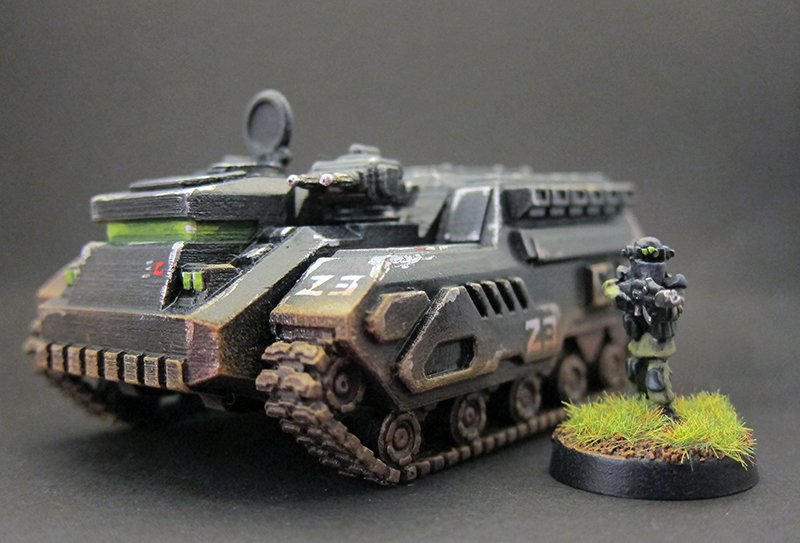 UNSC Lt. in the middle for scale. Can you see him? Ramshackle games make a great range of inexpensive resin models for 28mm post-apocalyptic gaming in 28mm. A big part of their range is a set of modular vehicle parts. I had the idea while looking at these online, that some of the parts would make excellent sci-fi buildings and bunkers. And the price is very affordable. The pieces took a week or so to arrive as I imagine they were cast to order, but once I had them in hand I was impressed with the detail and quality. These will make a great addition to my rough colony shacks and will of curse be perfect for Post-Apoc gaming as well. My best find of the lot is the PU cab at £2, which makes a great bunker for 5150. I finished this guy tonight and had to post a picture. I'm really happy with how it turned out, and it was really not hard to achieve. As most of the figure is a flesh area, it paints up really fast. I tried a NMM version of the sword, but it looked terrible. I think I did it properly, but it's not a technique that really shines in 15mm. So good old Mithril Silver with a Badab black wash replaced my fancy attempt. I enjoyed painting this so much that I immediately started one of the females in the set, and a Troll. Scott Pyle over at Four Color Figures is painting these right now too, and very nicely too. He has suggested he might try his hand at a "solo system"for small encounters based on his (excellent) Goalsystem rules. Needless to say, this is very exciting to hear! I've got the Barbarian bug now.. Expect a fair bit of this stuff coming up. Based on a news story from Dropship Horizon this week, I went over to the Copplestone Castings website to order some Snow Trolls. Somehow, nobody had alerted me to the fact that CC had also relased several other packs of Barbarians and "Northerners" which are Barbarians with beards. I picked up the Northern Heroes pack and the Trolls, as I was already feeling very guilty for not starting the ones I had. These minis are very very special. The sculpting is just ridiculously good. At first I was a bit scared of being able to do them justice with paint, but now that I've started one, it turns out that Mark Copplestone's 15mm sculpting style is very forgiving to the squinting 15mm painter. Clear areas of detail and good simple shapes that are easy to hit. Even the incredibly detailed face is a snap to paint as the detail is very deep with decent flat areas (like the forehead/brows and cheekbones) to catch your brush. 1. Black undercoat. Sounds crazy but will pay off getting the right amount of deep shadow. 3. GW Ogryn flesh wash. Applied with a brush, fairly heavy, not to the point of big pools though. *At this point the flesh actually looked pretty good. 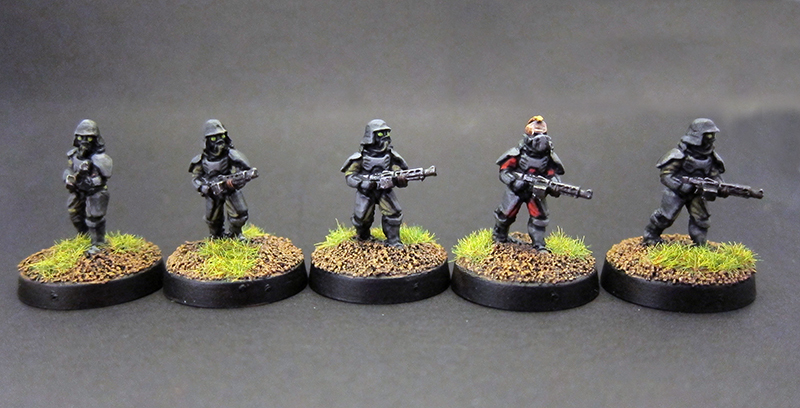 If you used a slightly lightened base tone, you could easily stop for "rank and file" troops. 4. Highlight with thinned Dwarf flesh. That's where I am for now. I'm going to do one more highlight with some Vallejo Basic Skintone mixed 30/70 with the Dwarf flesh to lighten it. The rest of the figure is pretty simple and I'll do in browns. The sword will be interesting because I'm going to try NMM technique on these figures. Am I crazy? Lets find out. Here's a few shots of a GZG walker I have painted up to use as a BTA in 5150SA. I filled in his faceplate with putty and smoothed it off to bring it more toward the MaK look I enjoy. Detail is a little soft, but not unbearably so. I got this guy and a friend when I ordered the new Crusty walkers. I thought Star Army used BTA suits but I think it's actually the ISS faction. Doesn't matter, 5150 is pretty freeform and takes modding very well. I'm cooking up an alternate Asset system that uses the models I actually have anyway. A 2 man BTA team will count as an asset for my Star Army campaigns. As I fill out the empty spots in my force for 5150SA, I needed a medic option. This is a figure from the UNSC Command and coms pack from GZG. I chose him because he looks different enough from other troopers with his medical kit and kneeling pose. His gun is on the ground too, which is a nice visual reminder that medics in 5150SA do not shoot at the enemy. I did the top of his helmet casing white and did his backpack green with a badge to try to help pick him out further. I have also started using little fragments of clump foliage instead of static grass on the bases of my figures. I'm not abandoning the static grass altogether, but superglueing a lump of this stuff on is a lot faster and less messy that the static grass. I think it looks pretty good too. How did I paint the red crosses onto areas that were mostly smaller than 2mm? To quote Egg Chan from Big Trouble In Little China: "Wasn't easy." A double-0 brush (I normally prefer a 0) and a lot of holding my breath were the key ingredients. This guy was actually done while waiting for other things to dry. I'm working on several brand new figures for Khurasan, which as usual are secret. They are looking good though, so hopefully I can show them soon. "Good morning ladies, welcome to orienteering on your new home, the planet Brown. Now listen up, we have a lot to cover!" "You will notice that all the terrain on this new world is based on CD's.. That's right, ordinary CD's. Why you ask? Because, they are uniform in shape, made of a sturdy plastic, a good size for a 15mm scale terrain feature. Most of all, they are cheap or free. Just tape over the hole in the middle and you are good to go soldier." "Here are some metal cast shacks from GZG. Also note the large metal container. These products are packed with detail and assemble fairly easily with superglue. Mounting them on a CD makes them easy to deploy and to store... Although they are damn heavy so 2 CDs glued together were needed to stop the base flexing. Spin the CD for a different battlefield orientation. The colors are bright so they are not boring, but follow a limited palette so they all go together well." "You will see these shacks are painted in less bright colors but have a lot of beat-up exposed metal. Apart from some Lego tires, this base is more open for variety, or loose object placement." "These are new improved forest sections. Hot glue was used to fix the flexible plastic plants to the CDs. The ugly transparent look was defeated by using Citadel Foundation paint mixed 50/50 with PVA, then heavily stippled onto the plants. The PVA stops the paint flaking off. That's right, it's fine! Yes there is another one, but they look basically the same." 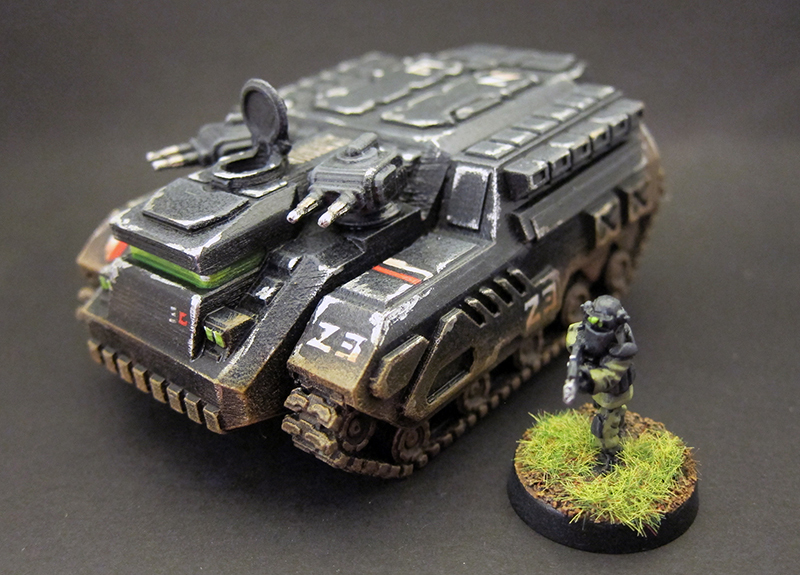 Here's another AT-43 figure I'm using as a 15mm walker. I took an ordinary Kolossus and pulled it all apart. Reversed the torso, repositioned the knee armor, roll bar, back tanks etc. Sculpted a camera/sensor onto the new front, sculpted new knee plates, then messed one up in the process of sculpting a little tarp roll on the back. I need to either get a curing lamp going, or just be more patient. No weapons either. I ordered some from TheScene and am waiting for them to arrive. No paint yet, as I haven't decided what faction it will belong to.. Either Star Army or Andromedan as a heavy/medium tank. I will probably do it as Andromedan as I'm liking the idea of the Star army having no heavy walkers, relying on the superior mobility of their BTAs and light walkers. Here is a Kolossus I have painted to be used as a medium/heavy tank for my 15mm Lhurrg forces. In 5150: Star Army, walkers simply use the same rules as tracked vehicles. I prefer walkers as they are a bit more suited my 2x2 play area. It is painted in the same colour as the Lhurrg skin, to help tie it to that force. I experimented with a chipped and rusty painting technique to show that the Lhurrg bought this walker and repainted it. Then didn't take very good care of it.. It's meant to look like it's been in the field (and out on the rain) for a long time. To sum it up, I panted the whole model dark brown and gave it a wash of brown/black mix. I then stippled on the yellow paint, avoiding the edges where the paint is supposed to look worn off or rusted through. Once that was done I did some very simple highlights and used some sepia wash in the joints and deep crevices to help it look rusty. The black markings are all freehand, which was something I havent done in over a decade. The white kill crosses are deliberately more crude.